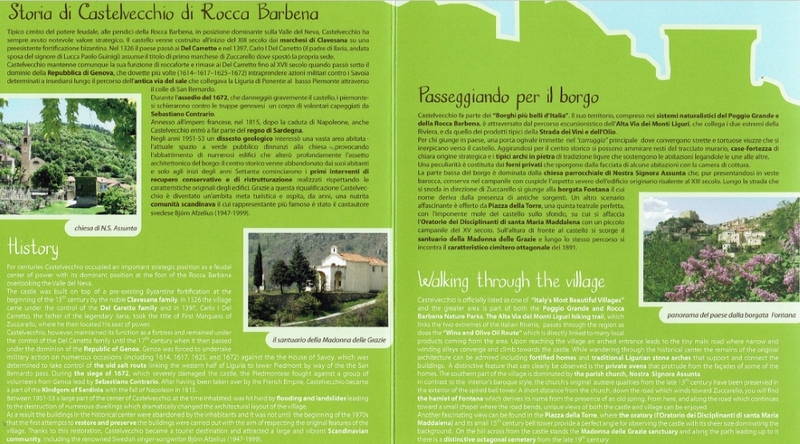 COLLETTA (2 km from the B&B Arvé) is one of the 4 hamlets that make up the village of Castelbianco. It became famous as the first “telematic” village in Europe. Abandoned for over 30 years, Colletta has been the protagonist of a global recovery project conceived in 1991. The renovation took place respecting the original materials and construction techniques, everything is a rise of stone “caruggi”. At the same time we worked to wire the village and get the optical fiber to date. Colletta, brought back to its original beauty, is an extraordinary example of medieval architecture where you live and feel the pristine environment and experience the pleasure of wellness and relax. ZUCCARELLO is 11 km from the B&B Arvé, in Val Neva. This small fortified village was founded in 1248. 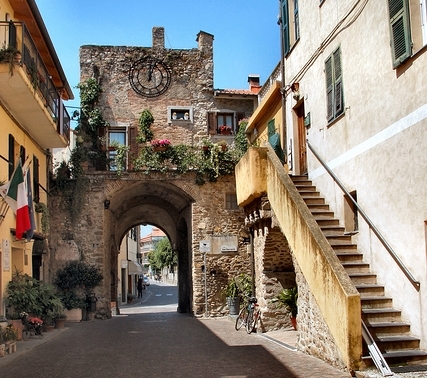 Its structure, consisting of the intricate “caruggi” (lanes) typical of Liguria, invites the visitor to discover every corner. Access to the village of Zuccarello was possible through a series of doors. 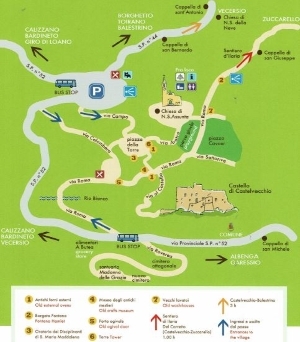 The main ones are the Soprana (north) or Piemonte gate and the Sottana gate (south). The main and most suggestive feature of Zuccarello are its arcades and the streets in the gallery. This architectural setting is typical of commercial villages. 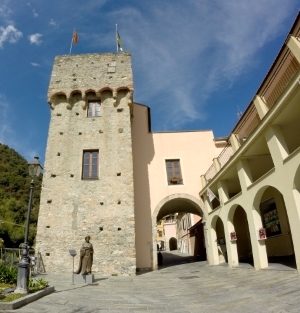 In the village you can also admire the towers dating back to the late fifteenth century, the doors of the old shops that open under the arcades, the parish Church of San Bartolomeo, the bridge over the Neva stream and the castle that overlooks the village in the first half of the twelfth century. CASTELVECCHIO DI ROCCABARBENA is 16 km from the B&B Arvé, in Val Neva. The territory develops on the average of the Neva stream, on the southern slopes of Rocca Barbena (1,142 m). The origins of the territory date back to a period around the first century. The Castle of the Clavesana was erected on a hill above the medieval village, the primary quadrangular structure with towers dates back to the eleventh century. From the manor the view over the village and the whole valley is particularly evocative. 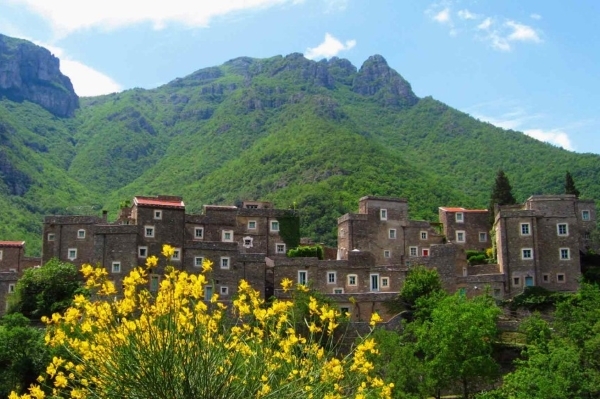 VILLANOVA D’ALBENGA (16 km from the B&B Arvé) is an ancient fortified village, dating back to 1250, built with a polygonal plan, it is still largely surrounded by the ancient city walls with the presence of the 10 towers and the 2 doors of access. At the center of the village is preserved the medieval well, which became the symbol of Villanova and until the thirties of the twentieth century the only distributor of drinking water for the inhabitants, with vintage chains and buckets. The territory of Villanova is rich in Romanesque and Baroque churches and many other testimonies of the time. The walks among the alleys, enclosed in the city walls, offer a magical atmosphere. In Villanova there is the only Ligurian racecourse, “Hippodrome of the Flowers“, the “Clemente Panero” International Airport and the golf of Garlenda. 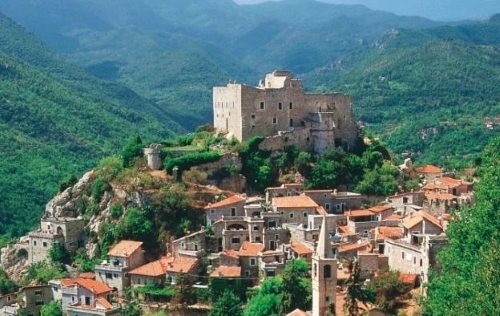 CERVO (40 minutes from the B&B Arvé) is an ancient village overlooking the sea. 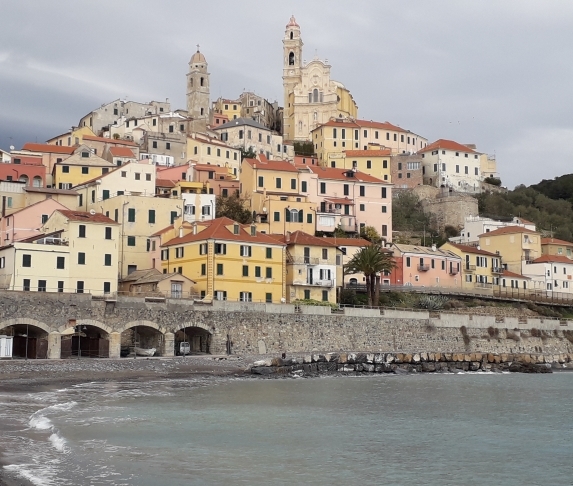 Along the Via Aurelia, the scenic road that runs along the Ligurian coast, halfway between Andora and Diano Marina is a must stop and go on foot among the “caruggi“. Cervo has preserved intact the characteristics of a medieval village, protected by towers and sixteenth-century walls, dominated by a castle and surrounded by green hills. The historic center is practicable only on foot and has been preserved with its buildings, centuries old, its cobblestone alleys where there are shops of artisans and artists. From the small square of the Baroque Church of San Giovanni Battista you can enjoy an enchanting view of the gulf. The coastline is characterized by the presence of small bathing establishments. Arenas and cliffs are free and discreet, the water is always clear, with seabeds rich in algae and fish. 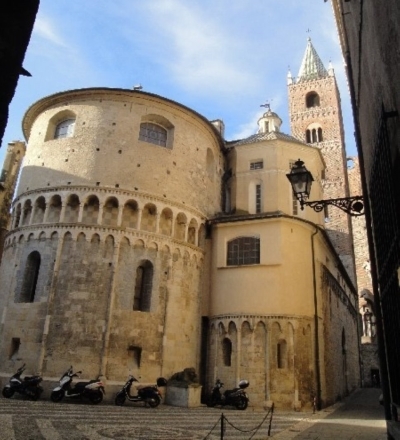 ALBENGA (17 km from the B&B Arvé) is a city of art to be discovered. The ancient core of the city of Albenga, recognizable by its characteristic red roofs, occupies the extreme part of the plain formed by the river Centa. With its historic center, the ancient patrician towers, the medieval walls, the Cathedral, the Baptistery, the noble palaces, the archaeological area of ​​San Calocero, the fort, the Sanctuary and the Pontelungo, the city hides treasures to be discovered at every angle. Albenga is also rich in interesting museums. The Diocesan Museum preserves a rich collection of works of art, the Sommariva Museum entirely dedicated to the civilization of oil, the Roman Naval Museum with its submarine archeology section, the Ingauno Civic Museum housed in the Palazzo Vecchio of the Municipality and the exhibition “Magiche Trasparenze” in which you can appreciate the vitreous finds recovered during the excavations in the necropolis of the city.